The story of Romeo and Juliet may have been one of the main reasons why I wanted to go to Verona. But of-course this city has so much more to offer than just being a romantic location for a love story. Verona is located between Milan and Venice and is bursting with Italian flair and lots of things to do and see. I only spent one day in Verona and didn’t have time to cover all the attractions. I left hungry for more, and will be traveling back to Verona for sure. So here are my 5 top things to do and see if you’re in a hurry. 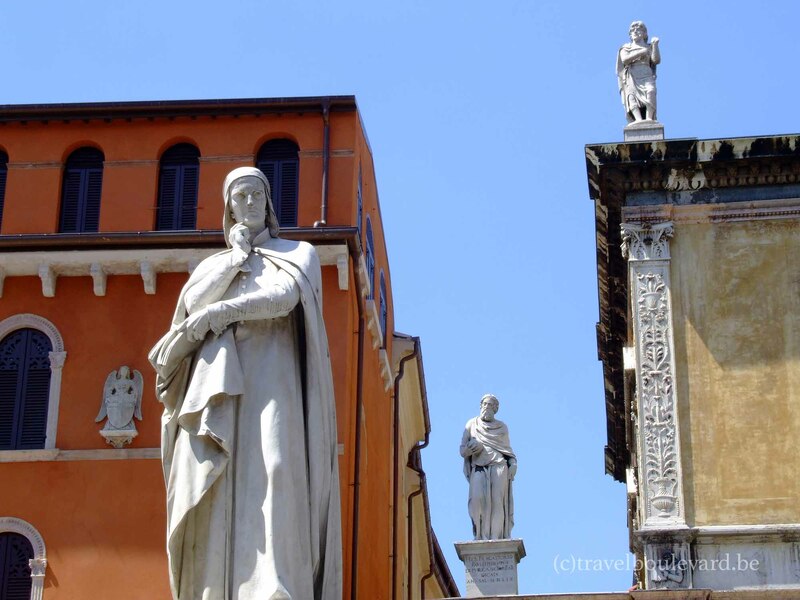 Can’t miss the Piazza delle Erbe: it’s the vibrant square in the heart of Verona. It used to be a Roman Forum and Verona’s old spice market. Until today the place is filled with market stalls, but now they’re selling fruits, vegetables and souvenirs. There are plenty of restaurants and bars to choose from, the perfect place to sit down, have a coffee or a glass of wine and enjoy the Italian buzz go by. Piazza delle Erbe is surrounded by the most beautiful historical buildings (like the magnificent Palazzo Maffei which has a stunning baroque facade) and (clock)towers. Another eye-catcher is the Fontana dei Madonna Verona, a beautiful fountain with a statue of a Madonna, holding a banner that celebrates the beauty of Verona. The Piazza delle Erbe. The Madonna statue is holding a banner that celebrates the beauty of Verona. When walking from the Piazza delle Erbe into the Piazza dei Signori, you’ll have to pass the Arco della Costa, an arch with a whale rib hanging from it (well, some people believe it’s not a rib from a whale but the remains of an ancient dragon!) . The rib is hanging there for more than 1000 years and legend goes that the whale-rib will not fall until a person who had never told a lie walks under it. If this is true, we can be pretty sure the rib will be hanging there forever! In reality, the whale’s rib was a souvenir brought home from the Orient by spice traders. The whale’s rib: don’t you dare to tell a lie. The Piazza dei Signori is another beautiful place to discover. Again this (small) square is surrounded by monumental building. This used to be the power center of Verona and the location of the former city government and court. Don’t miss the Palazzo del Capitanio with its tower, the 15th century tower hall Loggia del Consiglio and the 14th century Palazzo della Prefettura and the Palazzo del Governo, which used to be the residence of the Scaligeri family (an nobel family and Lords of Verona, they ruled the city from 1260 till 1387). Dante. Obviously having deep thoughts. 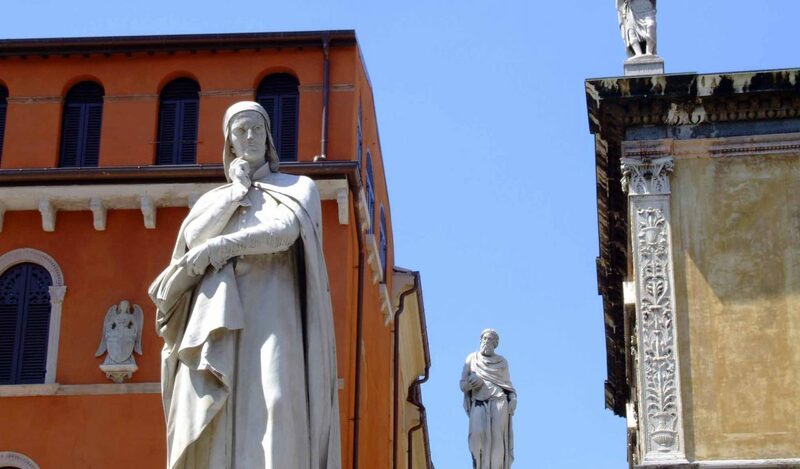 The piazza is also called Piazza Dante, because of the large statue of the Italian poet Dante Alighieri that was placed in the middle of the square in 1865. Climb the stairs of the Torre dei Lamberti to have a view over Verona. The 83-metre-high tower dates back to 1172 and belonged to the powerful family Lamberti (noble families used to build tall ‘tower-residences’ as a symbol of their wealth and power; the higher the tower, the more important the family was). The tower has two bells: Rengo and Marangona. The Rengo bell was called in case of an attack and told the people from Verona they should arm themselves, the Marangona announced the end of a working day, or when there was a fire. Today the bells still ring when there is a funeral. If you’re fit enough, you can tackle the more than 300 stairs to the observation deck of the tower (and if you’re not: there’s a lift available). The view over Verona is amazing! The impressive Piazza Brà is one of the largest squares in Europe, yet the piazza feels cosy and elegant, thanks to the many bars and restaurants, the historical buildings and palaces, the garden with cedar and pine trees (yes, there’s a garden within the square) and the view over the majestic Roman arena, located at the end of the square. The Roman amphitheater was built in the first century AD and was a great success. The shows and games were famous across Italy. At the time there was room for 30.000 spectators, today the arena can host up to 20.000 people. Famous artists and groups like Pink Floyd, Elton John, Radiohead, Muse and many more have performed in the arena, but the place is of-course most famous for its fantastic opera performances. Especially the Verona opera festival (every year from June to August, since 1913!) should not be missed, even if you’re not that keen on opera’s. Every night there’s a famous opera to enjoy (think: Aida, Madame Butterfly, Nabucco…) and the spectacle is truly amazing. Verona has so much to offer it’s impossible to cover all the attractions and things to do in one day. It was love at first sight for me. Can’t wait to go back and discover more of this beautiful city. Such and inspiration you are and so is your article. It truly inspired me to travel this year and i am thinking of going Paris this year and if i get enough time i would surely visit Verona and have some awesome experience there. Thanx for sharing your awesomeness, keep traveling and sharing. Thank you so much Rana! I also must admit: I am in love with your blog Nina! It is a great pleasure to have found you! Tip: If you have a student id, you can go up for half price! Gorgeous city and captured with beautiful photos. Verona is one of those Italian cities that has always captured my imagination but as yet have never been to. I agree with your choices, especially the opera – it is quite something to sit in the arena at night time and listen to the music (it’s a great visual spectacle as well). Hope you don’t mind if I put a link in your comments but this is an article I wrote about Romeo and Juliet in Verona – http://www.bewitchedbyitaly.co.uk/2013/10/searching-for-romeo-in-verona.html. Nice story about the whale rib. I guses it will never fall with all those people going around saying it’s the rib from a dragon! Also love the picture of a Piazza Brà – looks like such a relaxed atmosphere. What a charming town to sit in a cafe and people watch. I love the whale bone folk tale and never realized Verona was where the story of Romeo and Juliet was born. Looks like a really wonderful place to explore, get lost in, then do a little people watching over a coffee. There’s so much of Italy that I’ve yet to say. Hope I make it here before too long. Lovely photos by the way.